Tom James in action against Leamington for Tamworth. 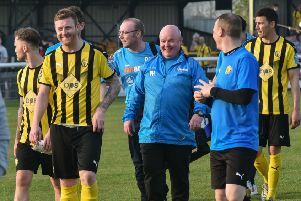 Leamington step up their Southern Premier League preparations tomorrow when they entertain old foes Stourbridge at the Phillips 66 Community Stadium. The clash with the Glassboys is the first of five friendlies before Brakes get their league campaign under way on August 6. A trip to Racing Club Warwick follows on Tuesday (7.30pm) and Holleran said these early games are all about fitness. “Ideally we’ll try and get minutes into all of the players Saturday-Tuesday,” said Holleran. He added: “It’ll be good to get back out on the pitch and into a routine. “We’ve got four Saturdays to prepare and we’ll take it nice and steady. Brakes will have a familiar face in their ranks tomorrow, with Tom James having returned for a third spell with his hometown club. James was part of the Jason Cadden squad that romped to a Midland Alliance league and cup double in 2006/07 and went on to sign a one-year professional deal with Watford after catching the eye of Sean Dyche while at Stratford Town. The 27-year-old went on to play for Nuneaton Town, Corby Town, Tamworth and, last season, Hednesford Town after being released by the Hornets and despite ending the campaign on loan at Rugby Town, Holleran believes players with James’ qualities are in short supply. “He was a little bit up and down last season but the couple of times I saw him he played well,” said Holleran, who also had James in for a brief spell on loan in 2012/13. “He can play two or three positions and has good versatility. “There is a dearth of good left-footed players about and he gives us good options. “Plus he’s local and he wants to do well. Speaking to the club’s official website, James said the ambition of the club had a major bearing in his decision. “I am really excited to have signed for Leamington and am looking forward to the season ahead,” said James. Striker Ben Mackey has joined ambitious Midland League Premier Division side Coventry United after parting ways with Leamington. Mackey finished last season with 23 goals to take his Leamington career record to 80 from 152 appearances. n Leamington are holding a community fun day at their Harbury Lane ground on Sunday (11am to 4pm). The days features a charity game, entertainment and food and drink.